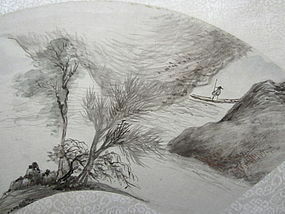 Chinese antique fan painting of a figure poling a boat through great rocky outcroppings, painted in ink on mica coated paper. A poem reads as follows: Passing through the gates of the old cave near the shores of the steep cliff, whoever moves through these crevices will find the seeds and roots of the clouds. Knowing that the clouds are suspended, the wind and rain are like fair ink, the misty mountain dyed and scattered have the appearance of mottled jade." attributed to Yun Shouping. circa 1910 Republic Period. Size: 20 1/2" long x 7 1/4" wide.